In both painting and printmaking, the term chiaroscuro references the contrast between highlight and shadow. While the woodcut medium originated in eighth century Japan, sixteenth century European artists manipulated the medium to produce these dynamic compositions. Invented in approximately 1509 by the German Hans Burgkmair, the chiaroscuro process incorporates a typical line block, generally printed in black, with tone blocks to create depth through varying shades. The process recalls chiaroscuro drawings, a popular medium at the time, which created the illusion of depth through the application of dark ink and light gouache heightening on middle-toned colored paper. 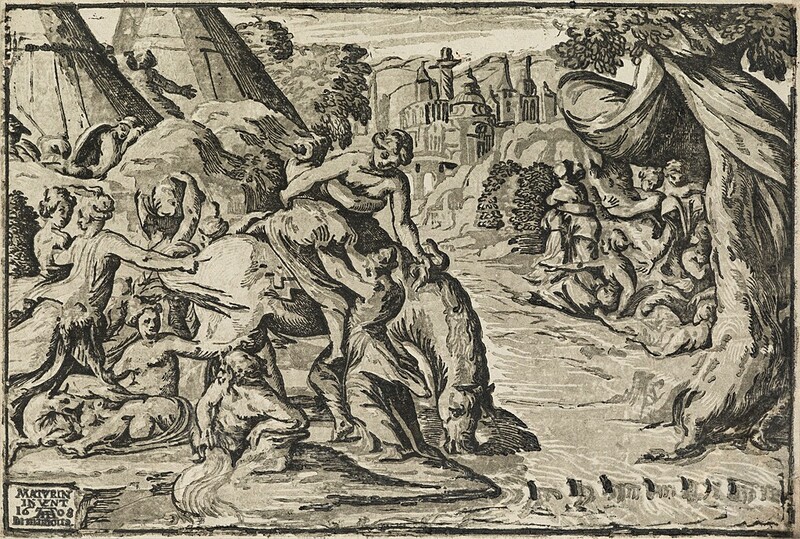 Lot 77: Hendrick Goltzius, Pluto, chiaroscuro woodcut, circa 1588-90. In Hendrick Goltzius’s Pluto, the chiaroscuro effects contribute to the legibility of the fire and smoke in the background, as well as the molding of the foreground figure. 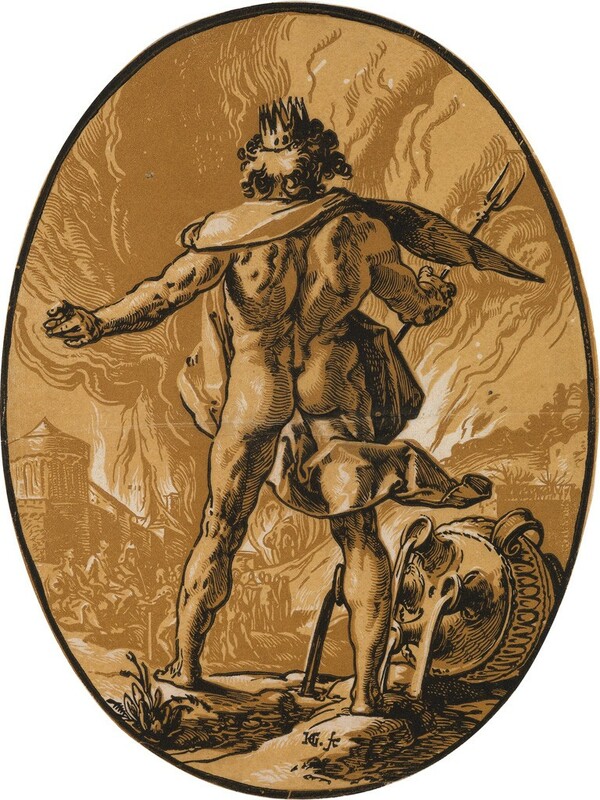 Goltzius was a leader among chiaroscuro woodcut practitioners, and this composition is one of several from this series of classical deities, which includes Galatea and Nox. Lot 65: Nicolò Vicentino, after Maturino, Clelia Crossing the Tiber, chiaroscuro woodcut. Nicolò Vicentino also created many chiaroscuro woodcuts, often after other artists’ designs. He may have chosen the chiaroscuro process to better emulate the original compositions. Clelia Crossing the Tiber is one such example; impressions of this print also utilize varying middle tones to realize effective compositions, with examples printing in ochre in place of gray, underscoring the importance of experimentation in the chiaroscuro method (see impressions in the collection of the Philadelphia Museum of Art). Lot 36: Albrecht Dürer, Ulrich Varnbüler, chiaroscuro woodcut, 1522. 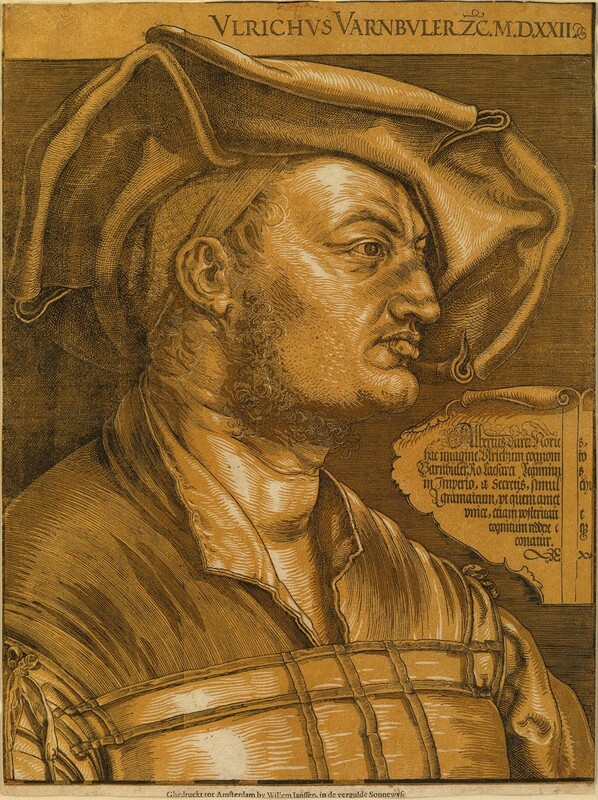 Albrecht Dürer’s Ulrich Varnbüler is a unique example in which the chiaroscuro tone blocks were added in the early 1600s, after the initial edition was printed. The extremely scarce lifetime impressions used only the 1522 line block, and the tone blocks were produced to mask wear to the original. Nonetheless, the composition benefits from the addition and chiaroscuro printings of the subject are in high demand today. Though the chiaroscuro technique fell out of favor after these prints were made, they speak to sixteenth century taste and capture the fashions of the time. 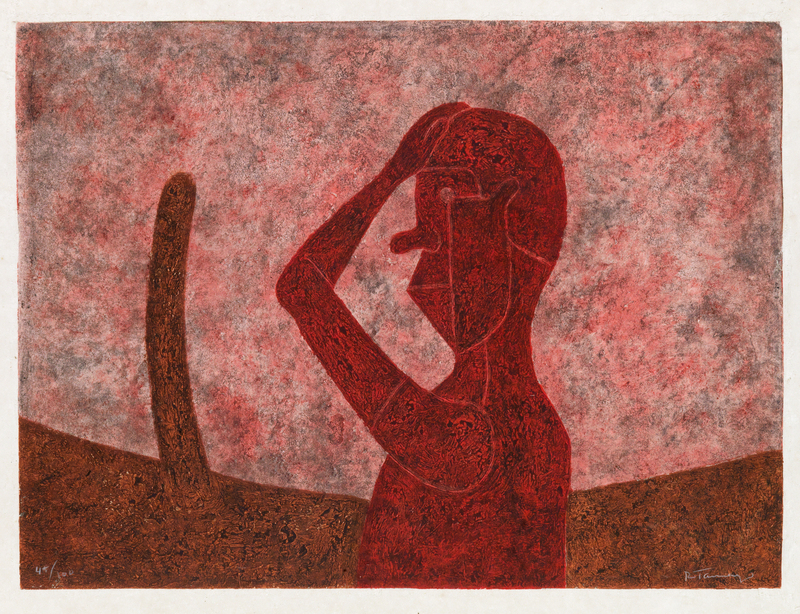 Though styles change, these woodcuts offer a timeless glimpse into the evolution of printmaking. For more Old Master Prints, see lots 1-249; for works by Pissarro: Impressionist Icon, see lots 250-317; for 19th & 20th Century Prints, see lots 318-540.